"An Officer and a Quartermaster?" This officer's picture was recently discovered in an attic in Ravenna, Ohio by Darlene Mihaloew (who graciously agreed to allow it to be published here). Judging from his cap and some information provided by Ms. Mihaloew, it seems reasonable to believe that this man was an officer in the 41st Ohio Volunteer Infantry regiment. The picture has a number of interesting historical points, especially in regards to the uniform the man is wearing (these points are outlined below). At this time, our best guess as to the man's identity is that he was Henry W. Johnson. If this guess is right, then Henry lived in Geauga county, Ohio, before the war. When a company of infantry began to be formed by the Honorable Peter Hitchcock (a prominent citizen of Burton, Ohio), Henry and two of his friends took up the call and began going from village to village in the area, recruiting. Eventually, the company they helped form ("The Hitchcock Guards") became company B of the 41st Ohio. Henry Johnson entered service with the 41st as a 2nd Lieutenant, but rapidly rose through the ranks. On Jan. 13, 1862, he became the Quartermaster for the regiment, and was appointed Captain on Nov. 20, 1862. He served as Quartermaster through the rest of the war, and received a brevet Major's rank on March 13, 1865. While the majority of the regiment had mustered out by the end of 1865, Henry Johnson stayed on active duty until July 27, 1866. At the conclusion of his service, he declined a commission in the regular Army, and became a successful manufacturer. Judging by the rank on his shoulders and the presentation sword in his hands, this picture was probably taken shortly after the end of the war. Now, having said all this, your humble editor must point out that this is all just conjecture at this point. If you recognize this man, we would sure appreciate it if you could drop a line to Pvt. Daniel McClory, and let us know if we're right, or wrong. On each shoulder of the officer's coat, rank bars are stitched on. Most rank bars used during the Civil War would have had a symbol near the front edge, and another near the back, so that they could be easily seen. Unfortunately, these rank badges seem to have their symbol set right in the middle, where they are nearly impossible to make out. From what can be seen, we guess that this man is either a major, or a colonel. The dark field of the badges probably indicates that this is staff officer, which matches well with Henry Johnson's position of Quartermaster. Officers in the Civil War usually wore frock coats like this one. Officers with the rank of captain or below would have worn coats with a single rank of nine buttons, like this one, and higher-ranking officers would have worn coats with a double rank of buttons. Judging by the bars on the officer's shoulders, he has a rank higher than captain, so it's another mystery why he has chosen to wear the coat of the lower rank. In Henry Johnson's case, a captain's coat would make some sense, given that he was only appointed to brevet major near the end of the war, and was a captain for nearly it's entire duration. 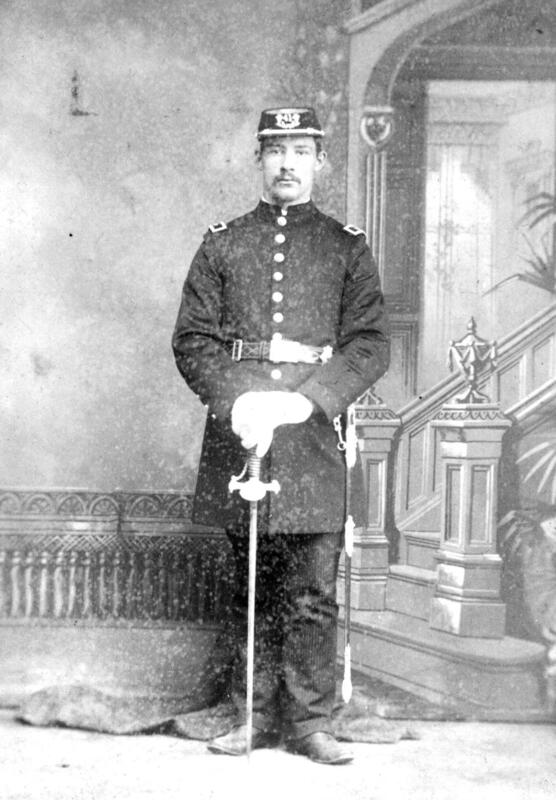 Most officers and NCOs during the Civil War carried swords. In the infantry, the official 1860-model officer's sword was straight and narrow, differing from the curved, heavier swords carried by the cavalry (and the 1850 model officer's sword). Standard issue swords for infantry were not as heavily decorated as this officer's sword, however, so this sword was probably presented as a gift or an honor. The cap is an unusual style of kepi called a "cadet's cap" or sometimes a "chasseur cap". This style cap was issued to West Point cadets in 1861 as part of the undress uniform. Such caps were also adopted by the 41st OVI, probably because Colonel Hazen was a former West Point instructor. They were one of the more distinctive features of the regiment's uniforms. The gold braid at the headband was displayed on officer's caps. It's a little difficult to see, but the device on the front is a "41" surrounded by oak leaves, and it is currently believed that this is the hat device used by the 41st OVI. The crown of the hat appears to have some form of decoration, but it can't really be seen. It may be a corps badge, as these were often worn on the crown of a cap. For the 41st Ohio, the corps badge would be a blue triangle (4th corps, 3nd division). Since corps badges were not adopted until late in the war, the presence of a corps badge on the uniform would be another indication that this is a post-war photograph. Infantry officers often wore very dark (almost black) blue pants, usually with a stripe running down the side. Some officers would wear the sky-blue pants that were issued to the volunteers. This officer has chosen to wear pants featuring a pin stripe, which are almost certainly non-standard issue. The pin stripe can clearly be seen if you click on the image and examine the enlarged version. The pin-stripe pants are yet another mystery. If this picture was taken after the war, they may simply be a nice pair of dress trousers that the officer thought would look good for his photograph.